post 730: Ballmer: Linux More Dangerous than Apple | What Will We Use? I say that we are in Gandhicon3 because Microsoft is targeting the Linux community. In the first years of Linux, it was easy to ignore since the user base was so small. Then free software was mocked with “just for geeks” thinking. Ladies and Gentleman, the days of ignoring and mocking are over. If you do FLOSS, Microsoft is fighting for you to come to them. Why should Microsoft care? Geeks have been on board with Linux for years now. Linux is 18 years old. It is time to introduce her to society: Your Linux is ready. The 80% that Nick is talking about have started to checkout the Linux and they like the maturity Linux brings. My mom bought this eeePC with Linux on ToysRUs’s website for under $150. She now has zero desire to buy another Microsoft product. Until now, she has been computing with Microsoft operating systems since 1992 because that’s what people did. If she isn’t the 80%, I don’t know who is. of started this year poorly. 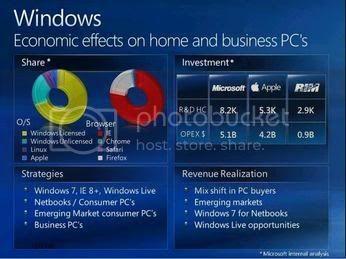 In February 2009, Microsoft held and investors meeting and what you see here are leaked images of the PowerPoint slides. Mr. Steve Blamer stated “we’re very focused in on both Apple as a competitor, and Linux as a competitor. I think the dynamic with Linux is changing somewhat.” and “I assume we’re going to see Android-based, Linux-based laptops, in addition to phones. We’ll see Google more as a competitor in the desktop operating system business than we ever have before.” For more info see The OSWire andLinux Pro Magazine. This entry was posted in GandhiCon 3. Bookmark the permalink. The problem with this comparison is, Android or Ubuntu Eee aren’t “Linux” any more than they are general-purpose OSes like Windows. They are Linux-based OSes that have a corporation behind them, paying someone to develop and support a specific hardware platform. The companies selling netbooks and smartphones have a vested interest in making the OS work flawlessly on their hardware, and don’t care about supporting random beige-box PCs. You can’t swap the video card out of your Asus Eee and then find out no one has written drivers to support hardware 3D acceleration on your card. You can’t change the motherboard in your Android-based phone only to discover that the ACPI quirks of your new BIOS break hibernate functionality. The companies selling netbooks and smartphones have a vested interest in making the OS work flawlessly on their hardware, and their hardware only. BSD became SunOS, but SunOS was not BSD. You couldn’t run SunOS on your 386 cobbled together from spare parts. BSD and Mach became NeXTStep and then OS X, but you can’t run OS X on your Dell Inspiron without a lot of hacking and license violations, and even then it runs like crap. Ubuntu Eee and Android are the same thing as SunOS and OS X: Vendor UNIX. It’s a concept that has been around for decades, and is the only smart way to support an OS. And it took more than 20 years for someone (Apple) to finally do it right, by making it easy and functional enough to appeal to the masses. Android and Ubuntu Eee may be based on Linux, but neither one of them are going to make running Debian on a Compaq or Fedora on your custom-built gaming rig any less of a nightmare. In order to increase the install base of Linux, you have to give up choice. Choice of window manager, choice of network management subsystem, choice of Web browser, choice of email client, choice of audio subsystem, and, most importantly, choice of hardware. And then it’s no longer Linux in the true spirit of GNU/Linux. It’s a Linux-based Vendor UNIX. And I’m perfectly fine with that. Just don’t delude yourself into thinking it means that Grandma will be installing Fedora 11 on her shiny new Dell laptop, and live-upgrading it to Fedora 15 in two years when Fedora 11 becomes unsupported. I have a new netbook with skype on it as well as a new ASUS skype only machine. My name on it is Suzenrose and I do not have anyone to skype to. on video sometime to see how it works. Umm… EeePCs come with Xandros. Ubuntu Eee does not ship on anything by default. Canonical has nothing to do with them. It’s just a bunch of Eee users who took Ubuntu, ripped out the kernel, made new kernel with the drivers they need, and put it back together. That Canonical hasn’t told them off for trademark infringement yet (like they did for Eeebuntu (now known as Easy Peasy), the last fork to try this) is surprising to me. Okay, Xandros, whichever. Point is, Asus pays someone (Xandros, the company) to make sure that Xandros (the OS) works on their hardware. Google pays its employees to make sure Android works on the Google-branded phones. So people are expected to just buy a new PC or laptop every couple of years? And how do you expect to get the initial install base? By convincing people to go buy a new computer with an OS they’ve probably never heard of pre-installed on it? Um…most people DO buy a new computer every few years. My family’s 8-10 year hardware refresh cycle is very slow and only made possible by the fact that I am able to replace dead PSUs, fans, and video cards. Aside from *that* bit, of course they don’t buy it without ever using it. You let them try it out. Hundreds of people have used my laptops to try Ubuntu at the Takoma Park Folk Festival in Washington, DC over the last two years. I don’t know how many more have used it at the Cleveland Park Library, where we setup an Ubuntu lab. We give out CDs, yes, but we also give out business cards with our names, phone numbers, and email addresses, so if they want someone to install it for them, we’ll do it. If they want to come to an installfest, great! The point is, they are not *forced* to install it on their own. mozilla 5.0 on Search Bot. 7 today.